What's a dynamic disk? - Ask Leo! Chances are that you have a basic disk, and don’t need the functionality offered by dynamic disk support. Even if that functionality actually is kind of cool. Leo, first, thanks for all I’ve learned from your newsletter and your books. A couple of weeks ago I bought Saved! Backing Up With Macrium Reflect and began learning how to use Macrium Reflect. I registered the book and downloaded the pdf version. A few days ago, I downloaded and installed on my Windows 7 laptop the trial version, version 5.2. Now that I’ve succeeded in creating the rescue CD and booting from it and creating several daily scheduled full backups on a 1 TB external drive, I decided to purchase it. But when I went to the website to buy a personal version for home use, I found that there are two options. A standard version 5 or a professional version 5. The web page explains that the professional license offers the features of the standard license plus “Dynamic disk support” and “Restore images to new hardware using Macrium ReDeploy”. I think I understand why Macrium Redeploy might be very helpful sometime in the future but dynamic disk support begs a few questions. What is a dynamic disk? Does my Windows 7 laptop have a dynamic disk? What is dynamic disk support? Does a home user, like me, need dynamic disk support for a Windows 7 laptop? It seems like a disk would be a really simple thing. You put some data on it, add a little organization around it to find that data and your done. Right? Dynamic disks are a little more complex, but the good news here is that most folks really don’t need to worry about dynamic disks. But they are kind of interesting, and I’ll go into some detail on the different things they can do. What makes a dynamic disk different? Basic disks are the disks you’re familiar with already. A basic disk pretty much matches the relatively simple idea that I described. The basic disk typically contains one or more partitions, each partition contains one or more volumes, and those volumes are formatted using one of several different types of file systems like FAT32 or NTFS. While there are several layers to this scheme, the approach is actually pretty straightforward. Dynamic disks differ in several different ways. 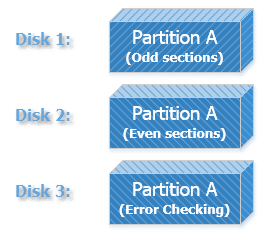 For example, rather than having a partition table to determine where all those partitions physically are on a disk, they actually have a partition database. That database implies that you might be able to do a few more things with dynamic disks than you would with a basic disk. Consider this really common scenario. You have a basic disk with two partitions and some unused free space. 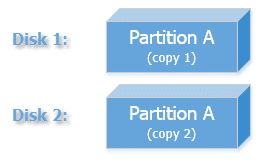 It’s partition A next to partition B, followed by that free space. 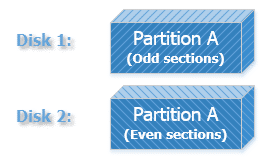 You could then merge the free space into partition A next to it so that partition A takes up the total. You’re left with a larger partition A followed by partition B, and that’s it. There are several partition-management tools out there that can do exactly what I’ve just described, and in later versions of Windows, the disk management tool itself can usually do this kind of thing. Dynamic disks are slightly more flexible in terms of partitioning. To your computer it looks like two partitions, pretty much as normal. But on the disk the partition is actually broken up and lives in two different places. Now, the technical term for those parts of a partition is “extent”. And as we’ve seen, extents don’t have to live next to each other to be used to create a single volume. 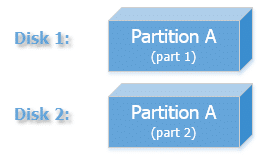 So, that partition A that we just talked about is made up of two extents: one before and one after partition B. As I said earlier, chances are you have a basic disk. Particularly, if you have only one drive, you almost certainly have a basic disk, and chances are that you don’t need the functionality offered by dynamic disks… even if that functionality actually is kind of cool. Should I Partition My Hard Disk? - Partitioning, or splitting a single physical hard drive into multiple logical drives, has pros and cons. I'll look at those, and make a recommendation. Does Having Multiple Partitions Shorten My Hard Disk’s Life? - Hard drives get laid out in fairly complex ways. Second-guessing how your disk heads move as part of a decision whether to use multiple partitions is not really a practical way to save a hard drive from failure. How do I use an “unallocated space” partition in Windows 7? - Unallocated space as a hard disk partition is space that won't be used. I'll look at the two common ways to make unallocated space usable. « Previous post: Can I Make My C: Partition Bigger by Taking Space from D:? Thanks Leo for a very easily digested explanation of a subject that has been confusing me for some time. By accident I ended up with my data drive as dynamic and found that the free version of Macrium no longer “saw” the backups I had stored there so I had to revert to a basic configuration. After I did so everything was fine.